1. Call us. 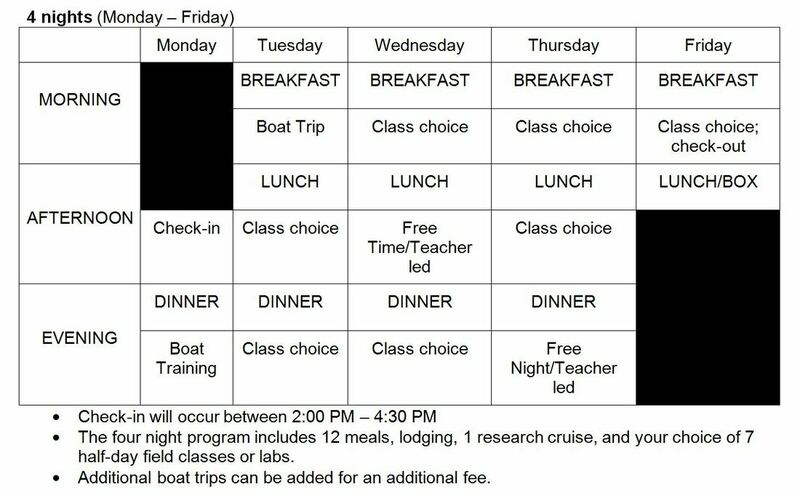 Identify which dates are available for your trip and call (757) 824-5636, ext.110. It is helpful if you have two to three “ideal” dates in mind so that we can get you on the calendar. 2. Reservation Form. Once your dates have been booked, we will contact you with information regarding your online reservation form. Once you have completed your online reservation form, we will send you your 10% reservation deposit. 3. Confirmation Packet. Upon receiving your reservation form and deposit, we will email you a confirmation packet confirming your program reservation with us. If there are ANY changes or additions to your program once you receive this confirmation, please notify us immediately. 4. Communication. Our goal is to provide an unforgettable education experience! We strive to provide a program designed specifically to suit your group’s needs. Continuous communication with the Field Station regarding your program is advised so, that we can best meet your needs and assist you through the planning process. 5. Finances. Raising money for your trip can be challenging, but it can also be a valuable learning experience for your students! We are happy to help you with fundraising ideas. 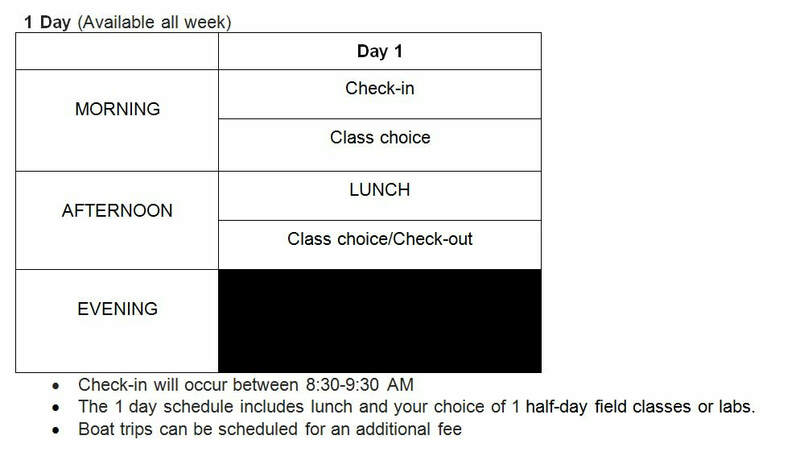 10% of your student cost is due thirty days after booking. 50% of your program balance is due six weeks prior to your scheduled dates. Two weeks prior to your scheduled dates, you will need to send your final payment. 6. Forms. Four weeks before your scheduled program, please send the final number of participants. You will be financially accountable for this number of participants. Having accurate participant numbers allows us to schedule groups efficiently, which means that more students can have an experience at the Chincoteague Bay Field Station. Please call the office at (757) 824-5636, ext.100 or email us with questions. We are here to help you! At the Field Station school programs run from Sunday – Saturday. You can choose to stay for as short as one night or as long as four nights. 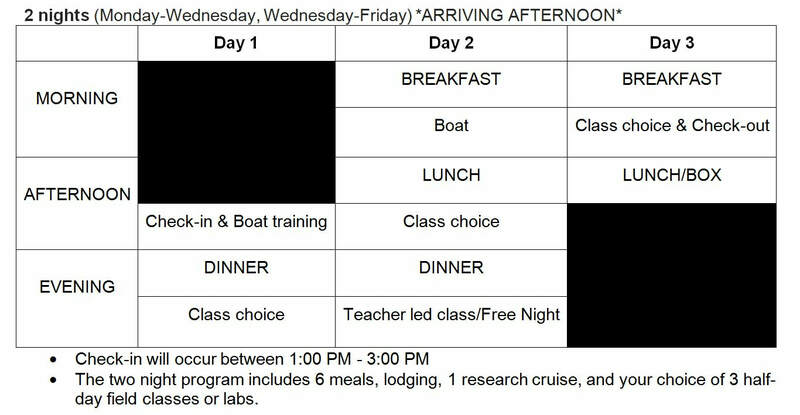 1/2 day and full day trips are available as well. Depending on the length of your stay you have the option to choose classes and field experiences that make your trip to the Field Station an unforgettable trip! Teaching groups can have a maximum of 21 students and 2 chaperones. We welcome multiple teaching groups from schools. For every 12 students of a gender there must be a chaperone of the same gender. There will be one Field Station educator for each group of 23 participants. 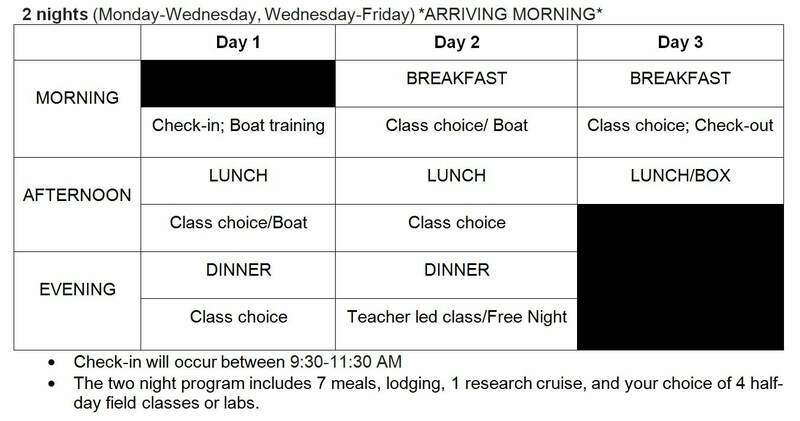 The student fee covers room and board, administration charges, all instruction, one research cruise, and use of all Field Station facilities during the program. All meals are served in our cafeteria. The only thing the fee does not include is transportation. If you need Field Station transportation while you are here, there will be an additional vehicle rental fee. See the transportation section below for more information. Click here to download the 2019 School Program Fees. Each year, some of the brightest young minds join the staff team at Chincoteague Bay Field Station. They share their enthusiasm, knowledge and love for science with students from diverse backgrounds. Our program staff are trained and experienced in marine and environmental sciences. All educators possess at least a Bachelor’s degree in the natural sciences, and many have several years teaching experience. All staff are certified in First Aid and CPR through the American Red Cross. We also have some staff members certified as Emergency Medical Technicians, Wilderness First Responders, and Lifeguards. We maintain a low staff to student ratio and all of our staff are certified in First Aid and CPR and trained to handle emergency situations. We are prepared to care for your students and provide a safe and secure environment. Our campus is comprised of multiple dormitories, classrooms/labs, a cafeteria, and plenty of open space! Visit our Campus page for a complete listing of our amenities. School students typically stay in our dormitory that was completed in 2010. Rooms are arranged in a suite style set up. Each of the three student rooms accommodates four students, plus an additional two in the chaperone room for a total of (up to) 14 people per suite. There are 4 sinks, 4 showers, and 4 toilets in each suite. The dorm also has a large common room, coin operated laundry, and is centrally heated and air-conditioned. Schools also can choose our traditional dorms. The traditional dorms were constructed in 1945. Each traditional dorm has two wings that contain 6 to 12 rooms. Each wing has a communal bathroom. Each room houses two people and is furnished with loft beds, drawers, and desks. These dorms are heated, but not air conditioned. The traditional dorms can house a maximum of 124 students and chaperones. We have a large cafeteria on that serves excellent buffet style meals. There is always a variety of hot food available, as well as a salad bar and cold items. If your students have any dietary restrictions, please let us know as soon as possible. We will do our best to accommodate all allergies and restrictions. There will always be vegetarian options available. While you are at CBFS, you will need transportation to and from our field sites for you and your students. 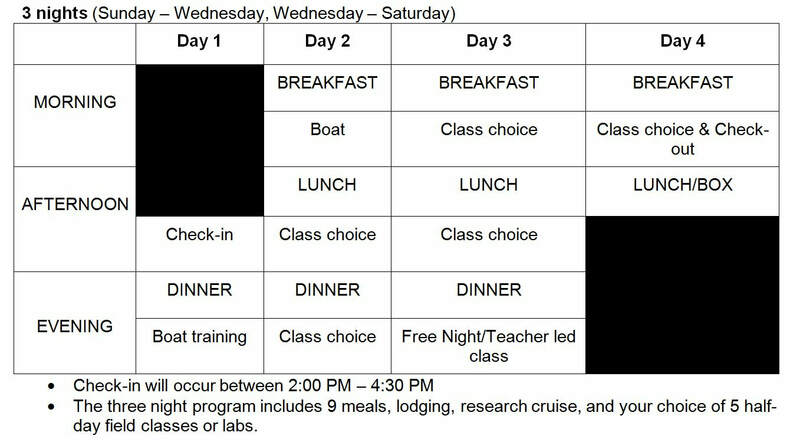 Every class we offer involves a field portion. You have a couple of options, you can either use your vehicles or you can rent some of our vehicles. Many charter bus rental companies will just drop off and pick up, they will not stay during your trip. If that is the case, you must rent our vehicles to get to the field sites. We have both 15-passenger vans and school buses so your group size will determine what vehicle you will need to rent. Please let us know if you need to rent one of our vehicles so we can plan accordingly and include the price on your invoice. "I learned about a month’s worth of science classes in two days." "Thank you for taking us around Wallops Island and showing us the beauty under the mud!"